Apple Tree Bed & Breakfast Our records show that this inn is closed. Ballston Spa bed and breakfast travel guide for romantic, historic and adventure b&b's. Browse through the iLoveInns.com database of Ballston Spa, New York bed and breakfasts and country inns to find detailed listings that include room rates, special deals and area activities. You can click on the 'check rates and availability' button to contact the innkeeper. Ballston Spa is a New York State village with streets lined with Victorian-era homes. Aside from the architectural wonders, the warmth of the residents can make visitors feel like they are actually at home. Ballston Spa bed and breakfast inns will tell guests about Old Iron Spring, where therapeutic water is found. A walking path is found here which leads to Kayaderosseras Creek. This village hosts the National Bottle Museum and Saratoga Historical Society at Brookside. Ballston Spa has many interesting shops, antiques, and arts and crafts. Visitors can go to the Strolling Village of Artisans to see the best of these crafts. 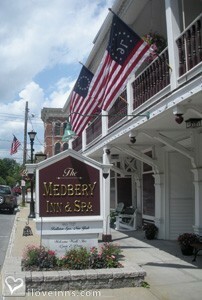 By Medbery Inn & Spa.